The Paradise, 19 Kilburn Lane, Kensal Rise, LONDON W10 4AE. It was in New York in 1980 that I first started to get ideas for Cabaret Futura. At that time there were some very exciting Performance Art spaces in Manhattan. Places like The Kitchen, PS1, The Artists’ Space and the Franklin Furnace would have regular events featuring the likes of Laurie Anderson, the dancer/choreographer Karole Armitage, avant garde musician/composer Rhys Chatham and the proto stand-up/monologist Eric Bogosian. I had the idea to present this sort of collaborative and fringe work in a mutated European cabaret environment. Arriving back in London from New York in Autumn 1980, following a solo American tour, still flying on adrenalin, I didn’t even consider the difficulties involved in running a weekly club, which would feature anything up to 10 different acts, performing in a number of different media on any given night. I just thought, ‘This is a great time. After all the cynicism and nihilism of late punk, ART IS COOL AGAIN.’ It was a case of needing somewhere for myself to play and, since it didn’t yet exist, inventing it myself. I told the journalist Simon Fellowes at the time, ‘Rock clubs pride themselves on the pathetic perpetuation of crass rituals and stale values, which are of no use to me’ I did all the administration from home, with Rene, my partner, helping out with artwork and publicity, booking acts and organising equipment. I remember the agonising wait to see if anyone would actually show up that first freezing December Sunday night. The line up for the first night was, as I recall, an extravagantly bequiffed Richard Jobson, reading poetry he had rather freely adapted from Sylvia Plath and Marguerite Duras; a two-piece synthesizer band called Blancmange; a mime artist whose name I no longer remember; stand-up comedian (now an actor) Keith Allen, who performed naked, with a steak and kidney pie which he fashioned into a surreal Lord Charles-type glove-puppet; and Rene and I performed a four-minute long dance-performance version of the DM Thomas novel ‘The White Hotel’, which she had choreographed and I had written some deconstructed music for. Cristina, the Ze recording artist and “Queen of Uptown Disco”, had agreed to perform something, and it was to have been her only London show, but characteristically some real-life, last-minute Madame Bovary-inspired drama intervened and she didn’t make it. Our clientele would enter through a small glass door, then go down a tacky mirrored staircase to a small lobby, all gilt and red flock wall paper, like a Louisiana whorehouse, where our enchanting door girl, Giussepina de Camillo, (now a fashion designer) would meet and greet. She always arrived for work accompanied by her pet, an 11-foot-long python named Sainsbury, who would lay dreamily coiled at her feet under the cash register for the entire evening. Once past the slumbering serpent the guests would pass through a small archway and into the main performance room, dimly lit with a small, raised stage with steps leading up from the floor. Tables and chairs ranged halfway back, a pall of blue cigarette smoke over the bar, and the exquisite thrumming of gossip. It had always been my intention to style the physical space of the club on the German model immortalised, if not invented by, Auden and Isherwood. Many reviewers typically took the easy way out and described the club as ‘decadent’, but I never really thought that it was. I mean, I was decadent, but I didn’t think the club was. It was debauched, but not decadent. I acted as a conferencier as well as an occasional performer. Sometimes I would perform one or two songs solo, sometimes a short set with a pick-up band. There were also times when, paralysed by drink, I would watch transfixed from the bar, a spectator at my own party, as the evenings seemed to run themselves. The regular audiences of 300 or more were drawn from an extraordinarily wide age-range- from 17-50 on a typical night. The style was dressy and eccentric, but not elitist, and so was thought to be more relaxed than some of the contemporary peacock palaces in London. Sounds magazine wrote, ‘Civilisation in a cellar in Soho. People of every stripe -and none- cram in without crushing each other, show mutual respect in the small courtesies needed to keep a packed crowd sweet, flaunt their individualism and yet point no fingers at the substantial minority in the crowd who choose to make no extravagant visual statements about themselves’. Its popularity and singular atmosphere meant that I had an extensive choice of performers who were keen to appear there. Since the entrance fee was only £1.50, budgets were tiny, and because there were so many performers each night, nobody was ever paid more than £25.00. The true and quintessential character of Cabaret Futura was indelibly established when The Event Group did their first show for me. 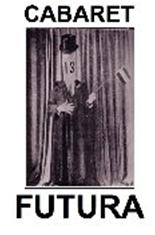 The Event Group was a performance art/living theatre collective of indeterminate number, based around the inspired visionary Tom Castle, and the physically insane Mick Jones. In addition to the nucleus of these two members, the group could also feature, for example, eight electric bass players, or 22 cricketers in full kit. After their first show, they were ever-present regulars, who would seep into the club in the afternoon like a patch of damp, to prepare for their evening show. They infiltrated the club like a virus, altering the space with installations, costumes, confrontation and cruelty. Sometimes they were like Antonin Artaud on absinthe, other times the Marquis de Sade on Mandrax. One of their masterworks, Haircut, Sir?, centred around a four-hour long ritual head-shaving of one unfortunate group member, lashed horizontally upside down to a pole, like an awful scene from Lord of the Flies which had ended up on the censor’s floor. As each of the other acts that night finished their set, (it was rare for anyone to play a set of longer than 20-minutes) the lights would come up on the Event Group in another part of the building, their soundtrack cranked up to Ultrasound, and the naked writhing figure would be shorn of a few more locks. Since re-opening in 2010 It has been my intention to harness the “can-do” spirit of Cabaret Futura and relaunch it, thirty years later, as a once-a-month meeting place for artists, performers, writers and free thinkers. Rather than being simply a music club or a comedy club, Cabaret Futura features talks, lectures, interviews and short films, as well as performances and uncategorisable entertainments. A typical evening lasts 2-3 hours, on a Monday night, in a convivial atmosphere- tables and chairs, drinks and conversation. It is be a place to network, to be inspired, and to relax. My guests have included artists and performers from across wide spectrum of disciplines….music from Michael Nyman and Ed Harcourt and Sarah Jane Morris, poetry from Kate Tempest and Jeremy Reed, interviews with novelists Rupert Thomson, Stella Duffy and ex-Spandau Ballet founder, the actor/musician Gary Kemp. Artists such as Richard Wilson, Liliane Lijn, Gavin Turk and Anne Bean have created special performances for us, and filmmakers Rudi Buitendach and Sam Fisher have delighted with short films.